Peer-to-Peer Networking and Applications disseminates state-of-the-art research and development results to facilitate effective deployment of P2P networking and applications. The journal brings together and fosters interaction among academic and industrial communities to promote further research that leads to new P2P applications and services. This journal not only addresses research topics related to networking and communications theory, but also considers the standardization, economic, and engineering aspects of P2P technologies and their impact on software engineering, computer engineering, networked communication, and security. It includes papers addressing system, application, and service issues. 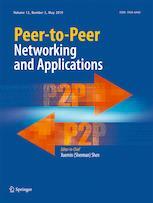 Peer-to-Peer Networking and Applications publishes original research papers, tutorials, reviews, case studies, and correspondences from the research, development, and standardization communities.